Two weeks ago, at the memorial service to President George H.W. Bush, his eulogists celebrated the extraordinary things accomplished during his Presidency on a bipartisan basis – including the passage of the Clean Air Act Amendments of 1990, the Americans with Disabilities Act, a crime bill, the 1991 Civil Rights Act, and even taxes and balancing the budget. President Bush believed that governing, in essence, required collaboration and to work with the other party in order to achieve lasting progress. Looking back, his legislative accomplishments stand tall as having made our country stronger – especially as compared to those of today. President Bush understood that policy advances often require compromise — and not just with the other party. Good policy must build on solid factual foundations, careful analysis, and judgment about how to balance competing interests for long-term success. He recognized that for environmental progress to be sustainable, it had to be achieved in parallel with economic gains and job security. And he knew that policy durability depends on the opposition sharing the victory – and feeling bought into the path set forth. As we have witnessed too often in recent years, one-party victories invite the dismantling of the program as soon as the other side takes power. By governing from the center, however, President Bush (backed by a creative and committed environmental team including White House Counsel Boyden Gray, OMB Deputy Director Bob Grady, EPA Administrator Bill Reilly, and many others) made real change happen. The 1990 Clean Air Act Amendments – the last major piece of environmental legislation adopted in this country – reflects a series of political horse-trades, but it launched a breakthrough SO2 emissions allowance trading system that has dramatically reduced acid rain across North America. It cut air pollution from cars by 40-80% (depending on the pollutant), and it set up a system for controlling toxic air releases that remains critical to American air quality today. Moreover, on the key issue of our time, the Bush Administration’s commitment to a comprehensive approach to controlling greenhouse gases with emphasis on market-based policies to reduce emissions, particularly acid rain pollution that had nearly destroyed parts our northeast, has been wildly successful. It is hard to imagine government working that well now — so many people have lost faith in our institutions. Even as we collectively desire for our government to make progress, we are locked in partisan battles that increasingly make that prospect more remote. I often shock my students by asking them what they think the final Senate vote on the 1990 Clean Air Act Amendments was. As none of these 20-somethings can remember a day when environmental politics was other than a wedge issue around which bitter partisanship swirls, the “B” students are sure that the vote was a bare 51-49 majority. The “A” students, aware of the Senate filibuster requirement, suggest a 60-40 margin. The actual vote was 89-11, reflecting a degree of consensus that is unimaginable today. In a similar display of bipartisanship, the 1992 Climate Change Treaty cleared the Senate with the required 2/3rds majority so plainly evident that no roll call was undertaken. I also think back to President George H.W. Bush’s “no-net-loss” of wetlands policy, that the Trump Administration rolled back this past week. President Bush was willing to work across the aisle with Democrats to secure fundamental environmental protections for the public. Thinking ahead to January, when the Government pushes the re-start button with the House of Representatives in the hands of Democrats, all our political leaders in both parties should keep in mind that in order to win political battles, compromise is necessary. But the one thing the American people do not wish to see “compromised” is our natural environment – the goal of clean air and clean water in the United States. President Bush understood that fundamental principle and led a bipartisan group of leaders who made it happen. 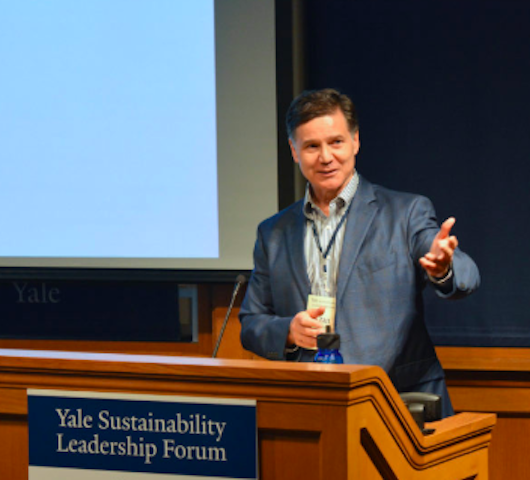 Daniel C. Esty is the Hillhouse Professor of Environmental Law and Policy at Yale University, and from 2011 to 2014, Esty served as Commissioner of the Connecticut Department of Energy and Environmental Protection.